2. Cream the sugar and butter until pale and fluffy. 3. Beat the eggs in one at a time, adding a little flour in each time, until the ingredients are mixed. 4. Add the vanilla essence and mix. Then add the milk 1 tbsp at a time, mixing after each addition. 6.Divide the purple mixture between the 12 cases. Repeat with the other mixtures in this order: Blue, Green, Yellow, Orange, Red. 7.Bake in the preheated oven for 10-15 minutes. 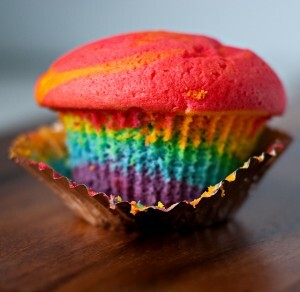 This entry was posted on at and is filed under Rainbow Cupcakes. You can follow any responses to this entry through the RSS 2.0 feed. Responses are currently closed, but you can trackback from your own site.